Indian food is often my comfort food. It’s always reminiscent of my childhood, and the amazing aroma that would fill the air as my mom would cook. 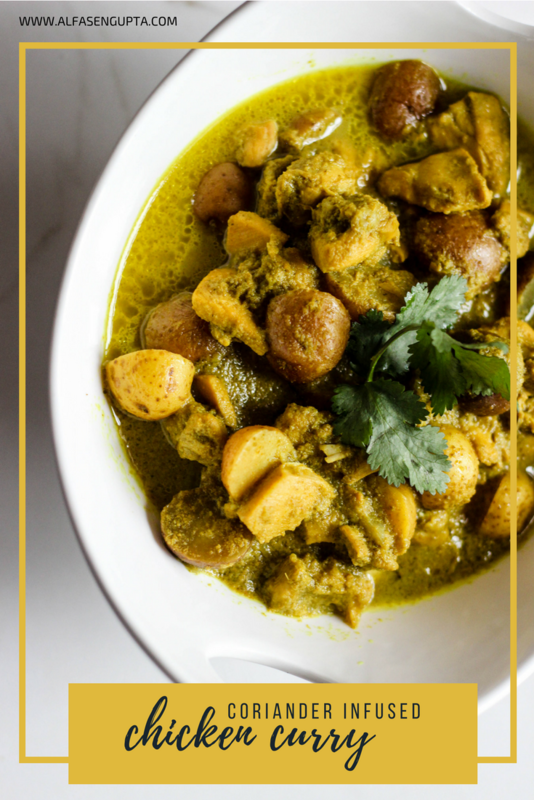 The one thing that I probably miss the most that was made weekly in our home, was chicken curry. 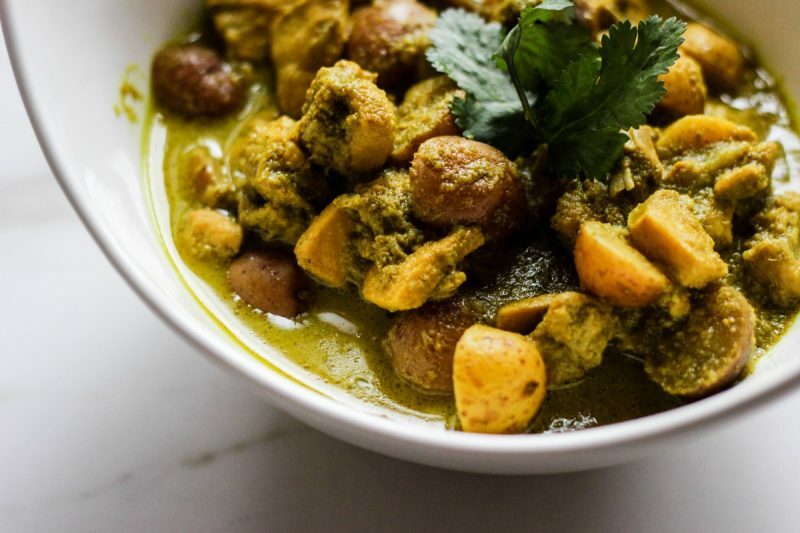 This would be made in all sorts of forms and different flavors each time, but that Indian chicken curry flavor is hard to beat no matter how you make it. 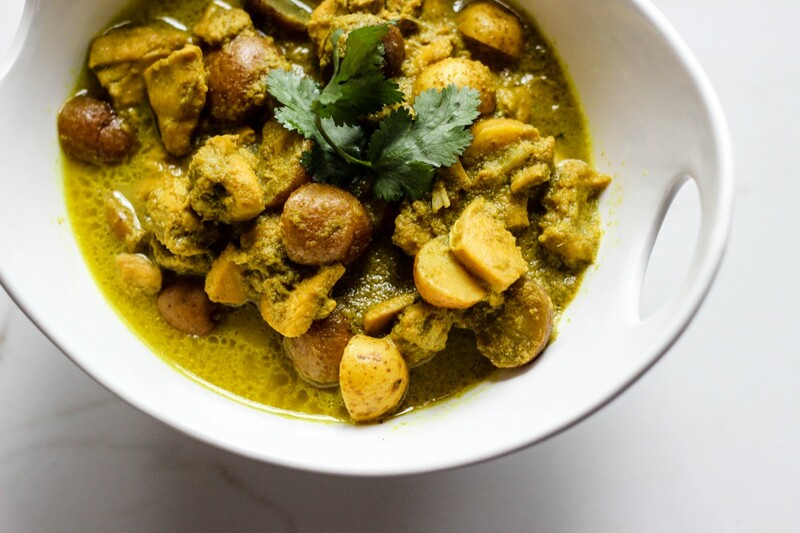 I will never ever be able to compete with my mother or my mother-in-law’s chicken curry, but I feel like after creating this dish, I got pretty damn close. No, like really really close. To say I was excited about being able to compare with their cooking says A LOT. And the thing is, I think if I can make this, I’m positive you can! I know Indian cooking is one of those things that definitely scares people. It can seem like there are a lot of ingredients and that it takes a lot of time (but not this one or this one! ), and while that may be true, the outcome can be so worth it. The flavors. The aroma. The fact that you always end up with leftovers because it’s always family style cooking. I mean, that’s a pretty important detail. Leftovers are legit. Especially for busy moms on the go. HOLLAAAAAA. 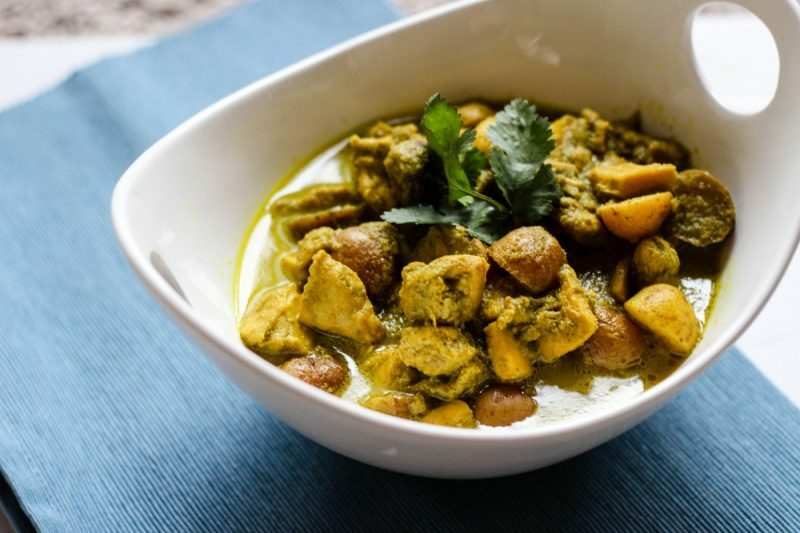 And chicken curries are one of those that can be such a crowd pleaser. My kids eat it up with some rice. Me and the hubs can eat it with some roti (tortilla) or naan or some cauliflower rice if we are avoiding carbs. And then come back and eat it again the next day for dinner in a separate combo. Trust me, the work is well worth it. And to be honest, most of the “work” is basically just letting it simmer on the stove for a while. Start with making the marinade. Take all the ingredients and blend with a little bit of water. You don’t want it to be too runny, but a good consistency so it can coat the chicken as it marinates. For best results, marinate overnight. If not, at least 4-5 hours in the fridge. When you’re ready to cook, start by adding a little bit of ghee into a dutch oven. Add in the 1/4 cup of chopped onion, the cinnamon stick, the cloves and cardamoms. Saute for about 5 minutes until the onions start to soften up. Add in the chicken from the marinade, but not the marinade itself yet. Start sautéing the chicken until it starts to look like it’s starting to brown and cook through. Add in the rest of the marinade and the halved potatoes. Add salt, pepper, and the turmeric. Cover and let simmer for about 20-30 minutes. Come back and give it another good stir! Same thing, if it’s sticking, add in a bit more water. Cover and let it simmer for another 30-45 minutes. Come back and give it one last good stir. You basically want it to simmer for a total of 2 hours or so. 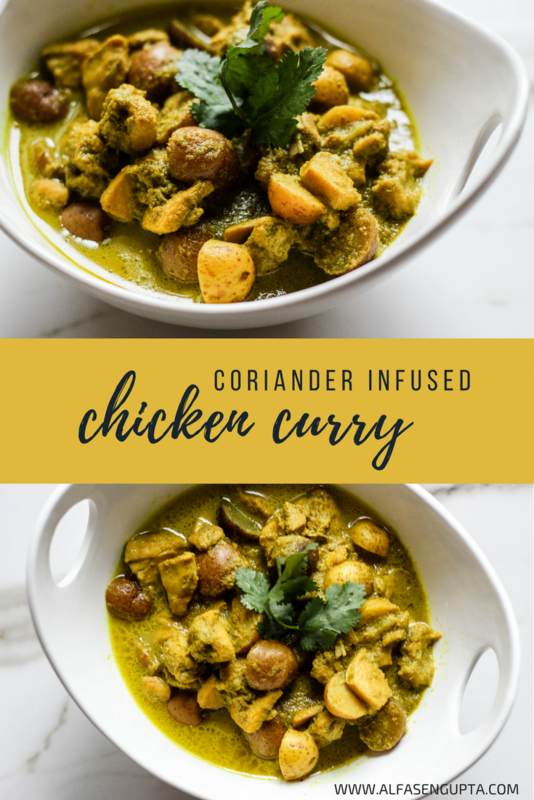 It melts the chicken into deliciousness, and the gravy tastes absolutely divine!! Taste it and make sure the salt is to your liking! If not, add in a bit more! 1. Start with making the marinade. Take all the ingredients and blend with a little bit of water. You don't want it to be too runny, but a good consistency so it can coat the chicken as it marinates. For best results, marinate overnight. If not, at least 4-5 hours in the fridge. 2. When you're ready to cook, start by adding a little bit of ghee into a dutch oven. Add in the 1/4 cup of chopped onion, the cinnamon stick, the cloves and cardamoms. Saute for about 5 minutes until the onions start to soften up. 3. Add in the chicken from the marinade, but not the marinade itself yet. Start sautéing the chicken until it starts to look like it's starting to brown and cook through. 4. Add in the rest of the marinade and the halved potatoes. Add salt, pepper, and the turmeric. Cover and let simmer for about 20-30 minutes. 5. Come back and give it a good stir. If it's sticking, add in a bout 1/2 a cup of water. Cover and let it simmer for another 30 minutes. Repeat this step another 2-3 times. You want it to simmer a total of 2 hours with giving it a good stir every 30 minutes and adding water as necessary. It melts the chicken into deliciousness, and the gravy tastes absolutely divine!! Taste it and make sure the salt is to your liking! If not, add in a bit more! 6. Serve with rice or roti or naan. Pin it so you can reference back! Previous Post Tutorial: DIY Chic Easter Painted Eggs from the Target Dollar Spot! Next Post How to Update Your Spring Wardrobe on a Budget with Thred Up!